Inspired by the success of Emmet Otter’s Jug-Band Christmas and earlier attempts to create Muppet holiday specials (like a Halloween special or even an “Income Tax Day” special,) Jim produced two charming shows in 1986: The Tale of The Bunny Picnic and The Christmas Toy. During a period when Jim was actively pursuing projects that could utilize the latest in computer graphics and digital technologies, these two specials were purposefully old fashioned puppet productions (although Henson puppets are never as simple as they might look). 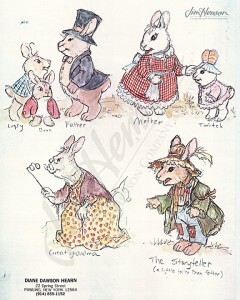 The Tale of The Bunny Picnic, combining elements of Beatrix Potter and the can-do spirit of Fraggle Rock, was populated by cute bunnies and the requisite Muppet dog. Capturing the joy of Henson picnics on the Hampstead Heath, Jocelyn Stevenson’s story coupled with Diane Dawson-Hearn’s visuals was well received on television and translated into an appealing picture book. The interminably cute star, Bean Bunny, became a regular Muppet ensemble player. The Christmas Toy, written by Labyrinth contributor Laura Phillips, also featured a new group of characters – an array of toys that come to life in a playroom when the household’s children, Jamie and Jesse Jones, are not around. The classic tale (almost a decade before Pixar’s Toy Story release) focused on friendship, the meaning of Christmas and how new toys would impact the group dynamic. Rugby the Tiger (performed by Dave Goelz) sets things in motion with a misguided plan that required the intervention of the other toys to make things right. The core Fraggle crew, Goelz, Steve Whitmire, Kathy Mullen, Richard Hunt and Jerry Nelson performed with younger puppeteers, Camille Bonora, Brian Henson, Rob Mills and Nikki Tilroe, and Jim performed Kermit to introduce the story. Airing on ABC on December 6, 1986, The Christmas Toy got generally good reviews. Variety described the new characters as, “…refreshingly varied and sophisticated,” and the story as, “…surprisingly effective.” In USA Today, Matt Roush called the show, “…an inventive and engaging treat.” Given the abundance of holiday specials on TV (Newsweek listed almost 50 programs airing that season,) just getting reviewed was an impressive feat. 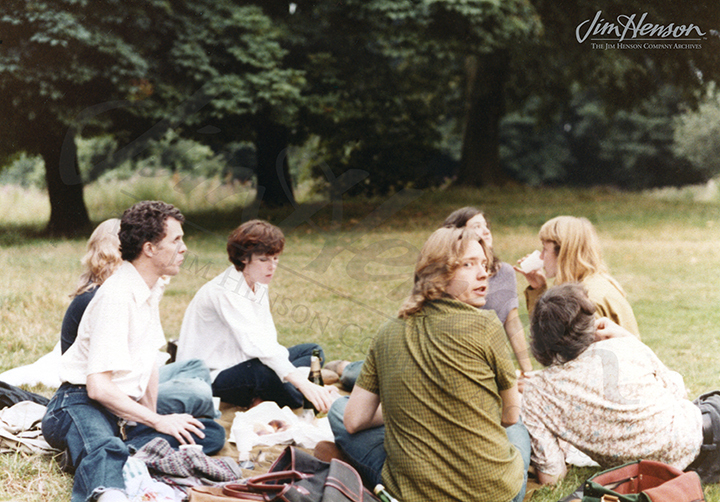 In interviews, Jim noted that he was inspired by The Velveteen Rabbit and The Nutcracker to try to create a whole new group of characters based on toys that come to life. He would have been pleased that a variation on this group formed the core cast of a new series produced by Brian Henson in 1994, The Secret Life of Toys. See the Christmas Toys in action. 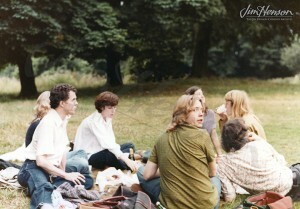 Jim and his colleagues enjoyed what they called “bunny picnics” on the Hampstead Heath in London. Diane Dawson-Hearn’s designs for The Tale of The Bunny Picnic, 1985. 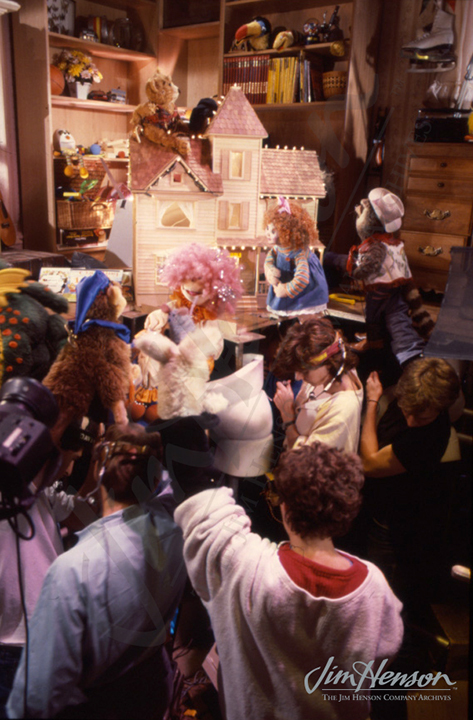 The performers shooting The Christmas Toy, 1986. 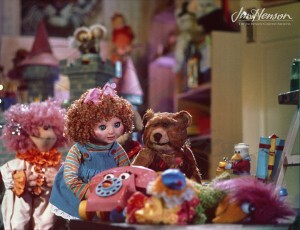 Characters from The Christmas Toy in the playroom set, 1986. Read more from Jim Henson’s Red Book in Imagination Illustrated: The Jim Henson Journal available from Chronicle Books on October 31, 2012. This entry was posted in 10-October '86, 1986, Christmas Toy and tagged Brian Henson, Camille Bonora, Dave Goelz, Emmet Otter's Jug-band Christmas, Fraggle Rock, Jerry Nelson, Kathy Mullen, Laura Phillips, Nikki Tilroe, Richard Hunt, Rob Mills, Steve Whitmire, The Christmas Toy, The Tale of The Bunny Picnic, Toronto. Bookmark the permalink.